The CNT-66 (top) and CNT-69 frequency counters. VICOM has announced the availability of the CNT range of budget frequency counters and timer/counters from Pendulum Instrument AB, one of the world's leading experts in time and frequency calibration, measurement and analysis. 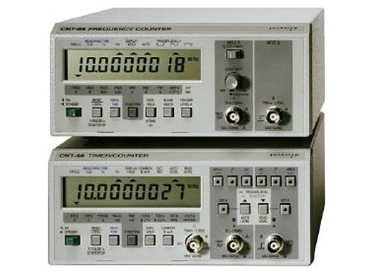 The CNT-66 and CNT-69 are high quality, easy-to-use budget counters for accurate and reliable measurements. The units use reciprocal frequency counting, giving 7-8 digits resolution even on low frequency measurements. The no-compromise input design of these counters, provide smart auto triggering to handle any type of input signal, plus variable sensitivity and other noise immunity functions. The input-protected counters are rugged and reliable with exceptional MTBF figures of up to 70, 000h. Both models have excellent EMC performance. The optional GPIB interface turns CNT-66 into a very low cost, fully programmable timer/counter. All counter functions including trigger level and sensitivity settings are GPIB-controlled. The bus-learn mode makes programming faster and easier. Trigger level setting can be automatic on all input signals. The trigger level can be displayed immediately with one keystroke, and input triggering is instantly checked with the tri-state LED trigger indicators. Input sensitivity (noise immunity) is selectable from 20mV to 1V. The CNT-66 has Volt peak measurements up to 50MHz. Both the minimum and the maximum signal peaks are displayed simultaneously. The multi-function CNT-69 frequency counter performs frequency, period, totalise, pulse width and frequency ratio or difference measurements. The CNT-69 can be used for frequency measurements on the bench or in the field. Easy to operate and easy to read, the counter features blanking of irrelevant display digits. The optional high stability MTCXO (Mathematically Temperature Compensated Crystal Oscillator) time-base offers stability comparable to standard oven oscillators but at a much lower cost. The temperature dependency of the individual crystal is stored in a non-volatile memory and used for immediate compensation of the displayed value. Unlike oven oscillators, MTCXO gives high accuracy instantly, without long warm-up times. Calibration and adjustment is very easy. Just connect the frequency standard and push a button. There is no trimmer to be turned.